If you are looking for a sailing holiday that combines some stunning scenery with superb sailing breezes then look no further than the Dalmatian coast and our great Croatian flotilla. If you can't spare the time to spend two weeks sailing, then the choice of which route is a tricky one. The Kornati route takes you into the Kornati national park, off the beaten track with beautiful uninhabited islands and bays to explore. The Southern route takes you to Split, Starigrad and Primosten, with some great open water sailing and beautiful anchorages along the way. Whichever you choose, you start and end your memorable Croatian flotilla holiday at the exclusive base in Sibenik, perfectly situated to explore the Dalmatian coast and the islands. 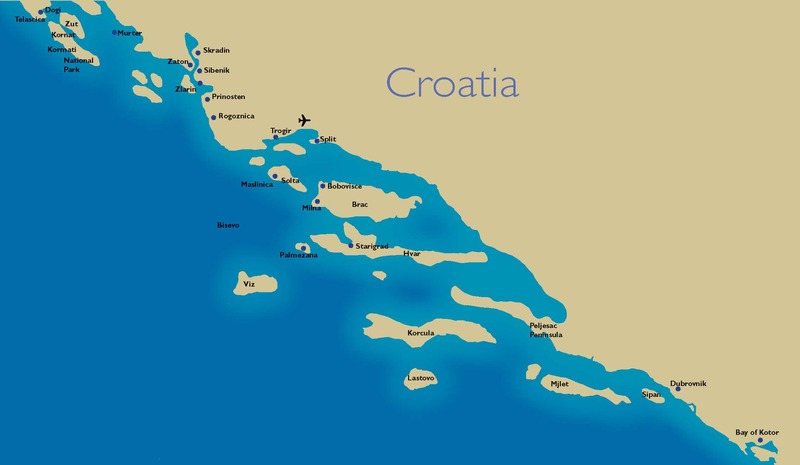 Please note : minimum RYA Day skipper or ICC + VHF radio licence is required for sailing in Croatia. Saturday: Arrivals & Departures – The two week flotilla continues with independent sailing with rendezvous in Kornati Opat. Sunday: Kornati Opat (20 nm) - Punch party and a fantastic evening meal on the south of this private island. Monday: Zlarin (8 nm) – Zlarin is a beautiful little harbour just off the coast and an ideal location for our punch party in the early evening. Tuesday: Murter (14 nm) –The capital town of the island with the same name with excellent fish restaurants on the quay. Wednesday: Sali (20nm) The main town in the Kornati national park, we have a choice of resturants for an evening meal. Friday: Sibenik, Zaton Marina – dine out in style at a local restaurant for our last night. Saturday: Fly UK to Split and transfer to Zaton Marina in Sibenik for embarkation. Monday: Trogir (16 nm) – Visit the beautiful old walled town of Trogir. Often likened to a mini Dubrovnik, this is also a UNESCO world heritage site, and not without good reason. Wednesday: Bay Stop (12nm) - Your chance to sleep in a million star hotel…..tonight we choose a bay for a peaceful evening at anchor. Thursday: Primosten (10 nm) –a traditional walled town, oozing character and charm. Friday: Sibenik (16 nm) - Two week clients continue with free sailing, one week clients join the crew back in Zaton for a farewell evening meal. Saturday morning charter flights from Gatwick and Manchester to Split with afternoon return from our Croatia flotilla base. Direct scheduled afternoon flight Gatwick to Split also available. Direct charter flights from Birmingham, Bristol and Stansted available on request. Direct road transfer to Sibenik (Zaton Marina) in approximately 50 minutes from Split Airport.